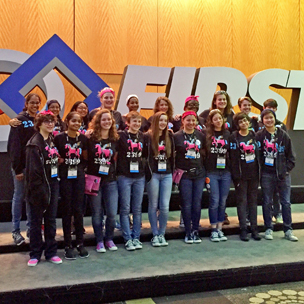 Hathaway Brown School is excited to announce that its Upper School Robotics team, the Fighting Unicorns, won the Team Spirit Award at the FIRST Robotics World Championship in St. Louis April 27-29. The championship event filled The Dome at America's Center with 406 teams from 26 states and five countries. The Unicorns finished with a 6-4 record and had the highest scoring match (451-345) out the 114 qualification matches on their field. The 19 students who traveled to St. Louis were team captain Hanna Keyerleber ’17, design lead Rosalie Phillips '17, fabrication lead Maggie Gehrlein '17, programming lead Lauren Egts '17, scouting lead Chloe Schwartz '17, outreach lead Mackenzie Bruce '17, branding lead Arielle Devito '17, electrical lead Anna Sobolewski ’18, business lead Catherine Liu '19, Alexi Jackson '17, Kate Snow '18, Roshni Sharma '18, Josie Carlson '19, Alia Baig '20, Neha Devireddy '20, Vedhasya Muvva '20, Layla Najeeullah '20, Rebecca Oet '20, and Abby Sobolewski '20. Please join us in congratulating the Robotics Team! The Hathaway Brown School Robotics Team, FRC Team 2399, was formed in 2007. It is the only all-girl FIRST Team in Northeast Ohio. Learn more in the Spring/Summer 2017 issue of HB Magazine.